The fixed Melita bridge on this ’53 makes it uber-rare. The romantic concept of the “Old West” – an enduring element of American pop culture – was spurred by pulp novels before John Ford introduced the world to My Darling Clementine and “Gunsmoke” arrived on the small screen. ’54 Round-Up: Dave Rogers/VG Archive. 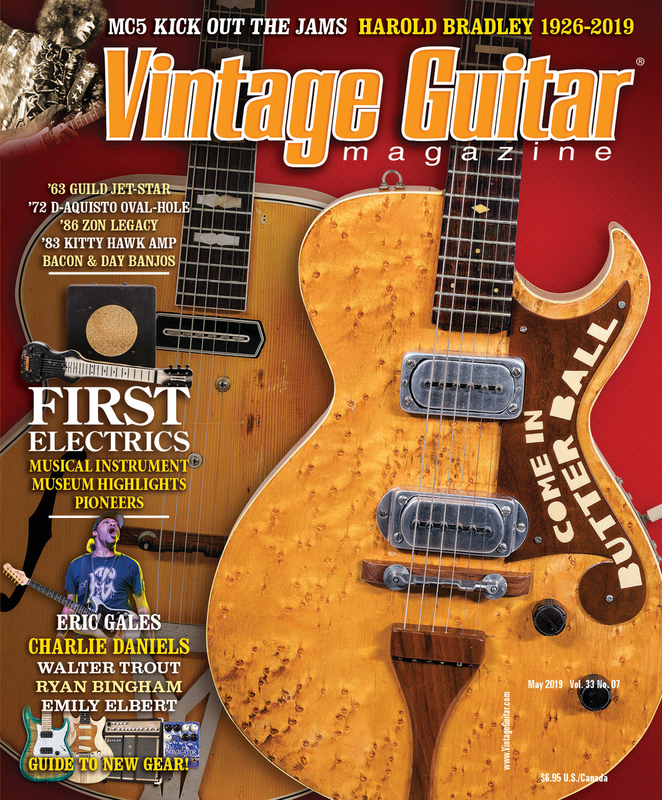 “The tortoise pickguard on ’50s Round-Ups was prone to disintegration, so precious few have survived,” notes Edward Ball. “Accurate reproductions are available, so collectors should be wary of any that remain in mint condition.” This one has the more-common floating Melita bridge. By the 1950s, everything from clothing to toys to candy had been offered to consumers using imagery of dust-blown frontier towns, singing cowboys high upon a steed, and buckskin-clad hombres spinning a six-shooter. 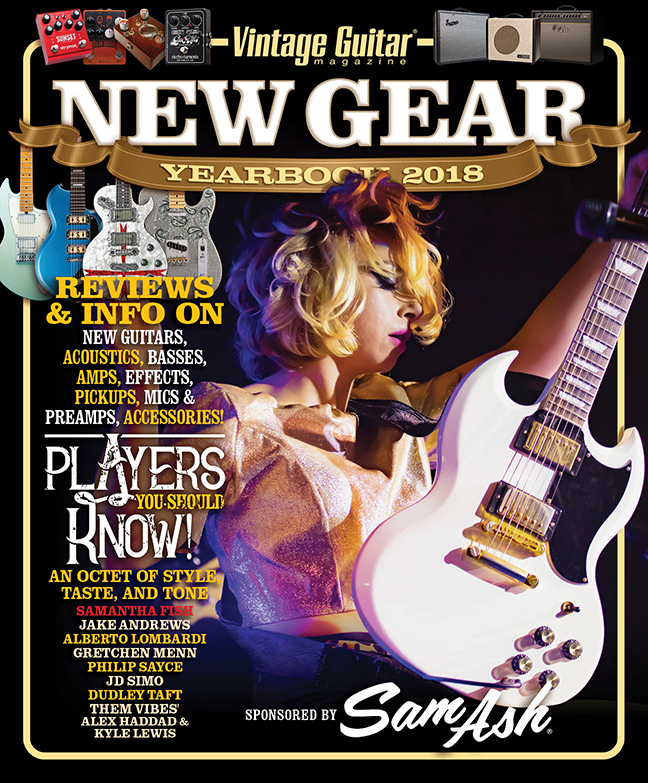 In the music-instrument biz, the Gretsch Company – underdog in the burgeoning market for electric guitars – couldn’t be faulted for delving into trendy gimmickry with the model 6130 Round-Up. Gretsch begrudgingly waded into building solidbodies in late 1953, when it launched the Duo-Jet to join Gibson’s Les Paul in chipping away at the dominance of Leo Fender’s Telecaster. And while its shape may have been borrowed, the Duo-Jet brought a sound, feel, and look all its own thanks to a “chambered” body (really, it was just substantially routed for electronics), DeArmond Dynasonic pickups, sophisticated Melita bridge and a top made of a thin piece of black plastic that Gretsch otherwise used to wrap drums. It had a fretboard with big pearloid block inlays, chrome hardware including oversized control knobs, a fancy archtop-like tailpiece with a “G” cut out of its center, and a multi-layer floating pickguard made of plastic. A truly dapper effort, it enjoyed a modicum of success, getting snatched up by high-profile rock-and-rollers like Bo Diddley and Cliff Gallup. If a particular one eventually earned “most heard” honors, it would be George Harrison’s, bought second-hand and used during The Beatles’ early days in Hamburg and on the band’s first few albums. But what about the country crowd? 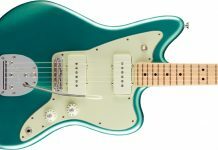 Was Gretsch content to let Fender’s new Strat join the Tele and wander that world unchallenged? The Silver Jet was as laser-focused at rockers as the Round-Up was at country pickers. Nope. Because amongst that late-’53 batch, Gretsch built 50 (batch numbers 12100 to 12149) guitars it called the Round-Up. Breaking dramatically from the Duo-Jet’s look, it had a pine top bearing an orange/brown stain that resembled antique furniture, maybe with a knot or two. And while that alone didn’t whisper “come hither” to a player whose stage attire included a Stetson, there was a decided lack of nuance to the oversized cattle-brand “G” burned into its front and the chuckwagon belt buckle at the top of its tailpiece. Indeed, where other guitars carried genre-specific connotations, Western-themed etchings on the Round-Up’s fretboard inlays, the steer’s head inlaid with pearl on its headstock, the tortoiseshell pickguard with engraving to match, and belt-like tooled-leather edge trim with upholstery tacks left no doubt about its target audience. 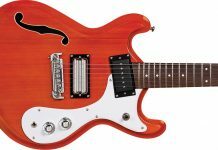 All that Western accoutrement aside, though, the 6130 was indeed a Jet, subject over the next couple years to the same changes in pickups, control knobs (going from “plain-topped” to “arrow-topped” in ’55), bridge, fingerboard markers, etc. 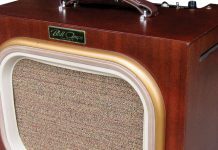 But where the Duo-Jet would remain the company’s stalwart electric, the Round-Up quickly fizzled; Gretsch records do not show any having been made in 1956 followed by a single batch the next year. ’54 Gretsch brochure courtesy of Edward Ball. 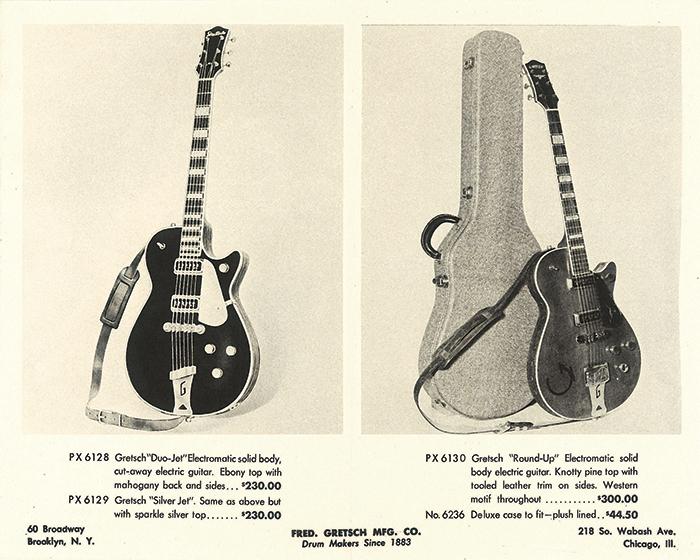 This page in a ’54 Gretsch promotional brochure shows the Duo-Jet and Round-Up introduced at the same time. 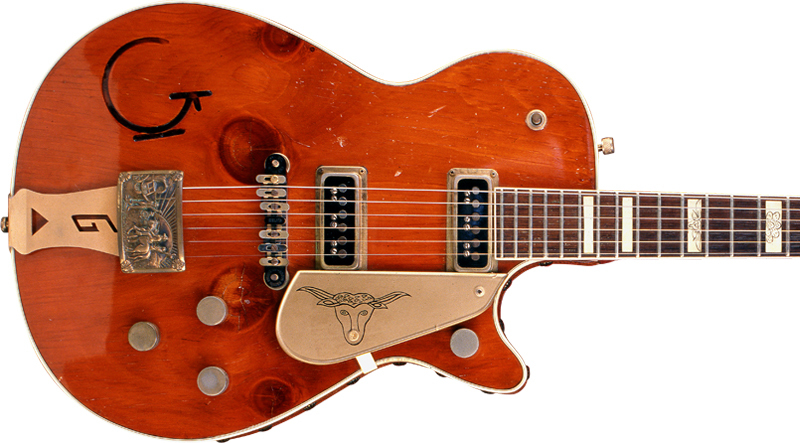 Gretsch last acknowledged the 6130 in a 1958 Project-O-Sonic flier, where it used a picture of a ’57 to illustrate the new Filter’Trons, Space Control bridge, and the thumbnail fretboard inlays. Whether or not it’s gold, all that glitters comes with a price. 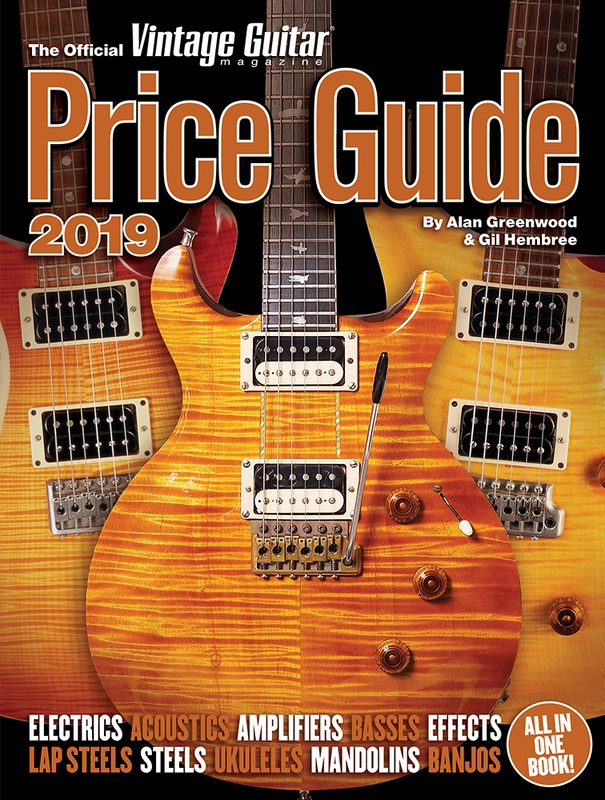 At $300 retail, the Round-Up was more than a couple notches above the Telecaster ($189.50), the ultra-modern Strat ($229.50), the Les Paul goldtop ($209) and even the metallic-drum-plastic-topped Silver Jet ($230) introduced by Gretsch in ’54. 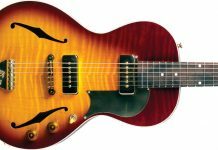 Though the Round-Up lost the draw, its Western dress lived on thanks to the 6121 Chet Atkins solidbody, the 6120 Atkins semi-hollow, and the 6022 Rancher acoustic (VG, January ’11). As Atkins’ influence increased, he urged Gretsch to ditch the Western sketches from guitars bearing his name, but he look resurfaced in ’74 on the 7620 Country Roc and has been retained on Round-Up reissues. Original versions of the Round-Up don’t often turn up for sale, and the knotty-pine-topped ’53 is particularly rare. 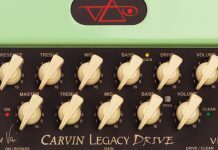 Its looks and scarcity give it high status amongst collectors, plus it’s one of guitardom’s true curiosities. 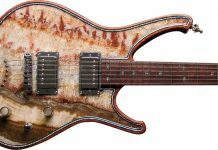 Where else does talk of a model involve terms like “G brand,” “cows and cactus,” and “steer’s head?” And don’t forget, it’s the only guitar factory-dressed with its own belt-buckle! 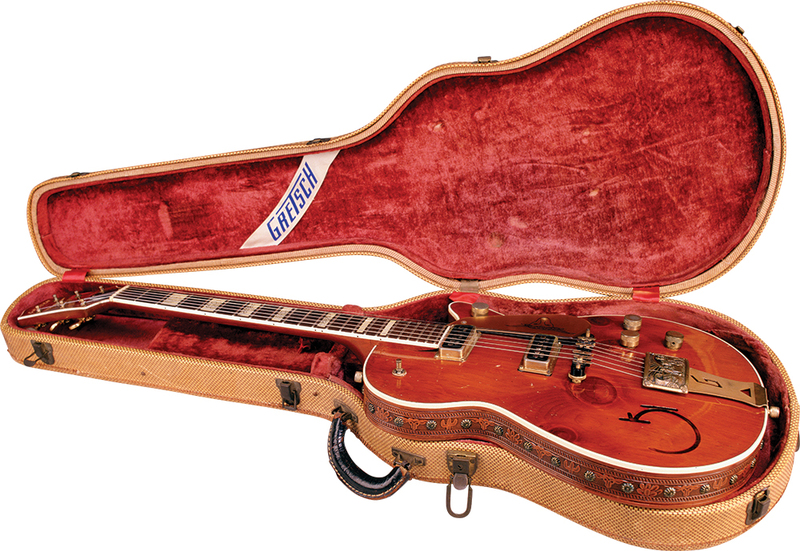 ’53 Gretsch Round-Up: VG Archive. The leather edge trim on the 6130 is derived from a Vogel belt. Vogel buckles match Vogel belts of the day. The tooling on the middle example shows the cacti and steer heads associated with Gretsch. Few guitar collectors are aware that Gretsch used actual stamped belt buckles on the 6130 Round-Up when it began building the guitar in late 1953. The first, slapped on a prototype, shows a steer’s head and two wagon wheels, its raised image giving a three-dimensional effect typical of the style and era. The buckle used on the production version of the Round-Up shows a fabulous scene with a cowboy and cowgirl riding into camp. There’s a stew-pot on the fire and the cook waving at incoming riders – dinner’s ready! In the background, a seated cowboy plays guitar as the setting sun drenches the sky. Each corner of the buckle is adorned with a four-leaf clover. 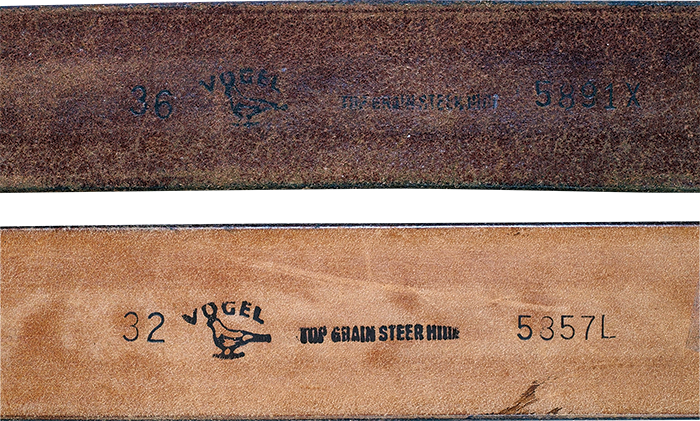 The Vogel stamp on the back of belts includes size and model number. Note the logo’s reference to “Vogel,” the German word for bird. The third buckle, used from ’74 through ’78 on the 7620 Country Roc, shows a longhorn steer’s head surrounded by fancy engraving on nickel-plated steel with a copper foil inlay on the front. It measures 33⁄8” x 17⁄8“. 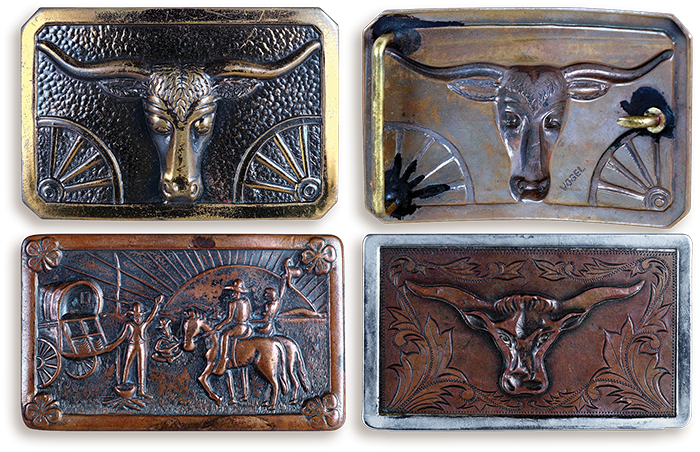 All were made by the Adolph Vogel Belt Manufacturing, which has been making belts and buckles in San Antonio since the late 1920s/early ’30s. 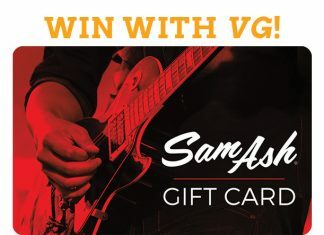 The leather edge trim used by Gretsch also resembles belts made by the Vogel company; the same cactus-and-cow tooled leather (as on the ’50s Round-Up) can be found on a belt stamped in upper-case, “Vogel, Top Grain Steer Hide, #5891X,” and the floral-tooled leather trim of the ’70s Country Roc resembles Vogel’s belt #5357L. The best place to find the buckles is online; search clothing, shoes, and accessories/vintage/vintage accessories/belt buckles, and you’ll find more than 60,000 buckles for sale. Add “Western” to your search parameters and it’ll be refined to 5,000 choices. The Vogel buckle shown here recently sold for $46.49, the Round-Up buckle for $31, and the Country Roc buckle for $14.80. A Vogel belt to match the Round-Up recently sold for $12.20, while the Country Roc belt sold for $9.99. Most have snaps for changing buckles, so, voila! (TOP) This circa ’54 buckle is the type used on a prototype Gretsch Round-Up. Its back is stamped with the maker’s name (Vogel). Made of brass, it measures 3″ x 2″. (BOTTOM LEFT) This style, portraying a scene around a chuckwagon, was used on the 6130 Round-Up. Made of copper, it measures 3¼” x 17⁄8“. (BOTTOM RIGHT) This buckle from the mid ’70s was used on the 7620 Country Roc. It has what collectors call the “fancy” longhorn-steer engraving and measures 33⁄8” x 17⁄8“. 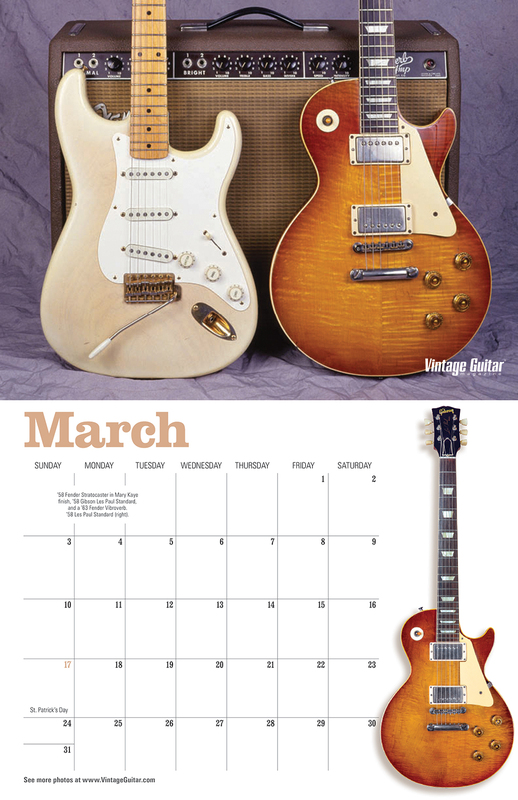 Special thanks to Edward Ball and Jim Hilmar, author of “The Gretsch Round-Up,” which can be read at VintageGuitar.com.